A mother I know has a 12-yo daughter who goes to school away from home. This girl, whom I will call “Mona”, can sometimes seem unresponsive to her parents. For example, when her parents come to pick her up at school, she may at first appear to ignore them instead of running to greet them with the enthusiasm the other girls show their parents. Mona also struggles in school and requires academic support. Her development has been atypical; neuropsychological testing suggests that using language to make sense of her world is a particular challenge. Even making sense of her bodily sensations may escape her so that she neglects to put on her coat when it is cold outside. It also seems that picking up cues about others’ feelings and from her own emotional state is difficult for her. This does not mean that Mona is without feelings or insensitive. She in fact feels things deeply and can be very sensitive to others. It is just that it sometimes takes her more time or more energy to achieve a state of responsiveness. She needs to “put it together” instead of it smoothly coming into place the way it does for people with typical development. Because her internal world is often confused or poorly integrated, she can be hard to “read”. She is not an easy child to parent. One time, on the way to pick Mona up at school, her mother was reflecting on some of the frustration and disappointment she and Mona’s father felt in their relationship with her. She decided that she would have to search for a better way of expressing her love for her daughter, one that Mona could “hear” better than conventional ways. She was particularly conscious of Mona’s embarrassment at expressing feelings for her parents in front of the other girls. When they met, she said, “You know, Mona. I was thinking on the way here that I always say, “I love you, I love you,” but that doesn’t really capture the depth of the feeling I have for you. We have to think up our own words for it.” The next day, a thought occurred to her. She spoke to Mona again. She said, “I thought of it, Mona. ‘I glove you’. Mona’s mother was thinking of surrounding her daughter with her love, the way a glove surrounds her hand. It may also be that she was thinking of her wish to protect her daughter from the cold in a way that Mona herself sometimes seemed unable to do. Finally and perhaps most important, in her suggestion that they “think up our own words for it”, her mother was showing Mona that together they could be creative in the ways they communicate their feelings to each other. They did not have to restrict themselves to conventional language. The next day when they said goodbye to each other, her mother held up her hand. Mona smiled and raised her hand. Mona’s birthday is close to Christmas. This year her mother wanted to make something special for her. 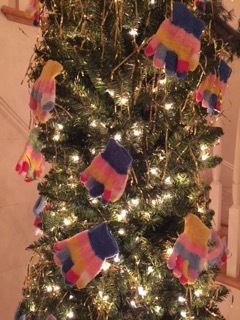 Instead of typical Christmas decorations on their tree, her mother decorated it with different colored gloves. While the tree is very attractive, it also has special meaning for Mona and her mother. It is a way to say, “I love you” without words. It captures new possibilities for mutual understanding and for ways of growing their relationship. Maybe it is a way of saying “Happy New Year” for next year and for the future. As I always say, parenting is a creative enterprise. This entry was posted in Articles and tagged communication, learning disabilities, Nonverbal Learning Disabilities on December 26, 2015 by Alexandra Harrison. We visited the three private schools attended by the children in the home. Whereas they all bore the stamp of Salvadoran educational philosophy, they were very different. 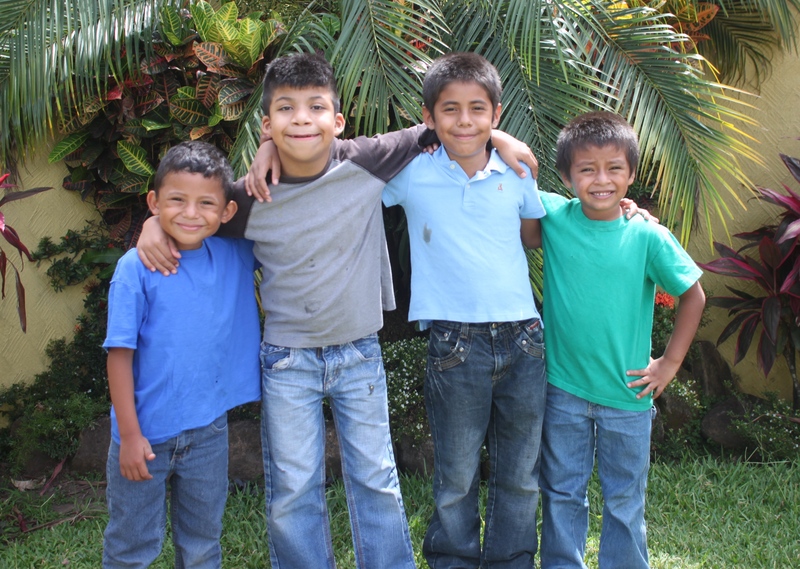 The most strikingly different was the Laura Lehtinen school recently started in San Salvador. This school for children with learning disabilities was remarkable for the high teacher/student ratio and the skill of the teacher we observed. The child we were observing, “Tomas”, had demonstrated slow development from infancy and had always struggled in school. In his last school, he was very unhappy. In this new school, his contentment was obvious. Tomas’ classroom had 8 children, though only 4 were present during the lesson we observed, the others apparently in an adjacent room with another teacher. The teacher in Tomas’ room worked individually with a student for about 10 minutes, then moved her chair and began work with another. As she attended to each student, she periodically turned to redirect another student who had strayed from his or her academic agenda or who needed immediate attention. She had great patience and tolerance for Tomas’ behavior – which included frequent departures from his seat and making little dancing or hopping movements – and she gave him many affirmations for correct answers. An important focus of my school observations is the playground. In Tomas’ school, both teachers were present for the entire playground activity – an unusual and welcome observation, since so much can be learned on the playground, and opportunities to support that learning are so frequently missed. The atmosphere on the playground was relaxed and pleasant. Tomas needed to be redirected once when he strayed into territory outside the bounds, but otherwise he enjoyed himself watching some of the older boys and playing with a girl classmate. Although Tomas’ difficulty following through with an agenda was apparent in his playground games as well as in the classroom, his ease in making social connections and his friendly manner seemed to mitigate his many abrupt departures from the game. The other two schools were also good schools with dedicated teachers and lively playground activities. One was more academically rigorous than the other and had smaller classes. In this school, the teachers were able to engage their students in the material they were teaching to an impressive degree. We focused on several children from the home in this school. One, a handsome boy of 13, was often distracted by the attentions of the girls sitting near him. Another, a 10-yo girl, seemed focused on filling in the answers in her workbook instead of listening to the teacher. Liz and I took careful notes and returned to the home to discuss our impressions. This entry was posted in Articles and tagged Laura Lehtinen, learning disabilities, playground, school observation on August 5, 2014 by Alexandra Harrison.